The 8 Best Ice Cream Parlors in Wyoming! You’ll find all your favorite flavors at Wyoming’s best ice cream parlors. But you’ll also find some unique offerings specific to Wyoming, like huckleberry-flavored ice cream—a berry native to the northwestern United States. 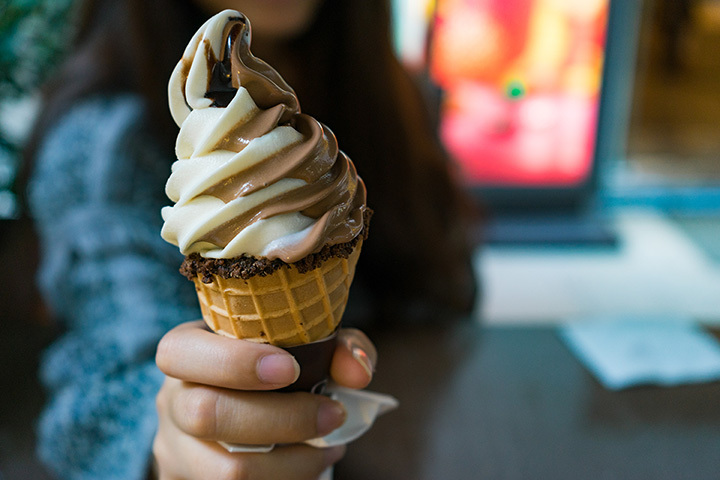 From award-winning shops to quaint mom and pop spots that will take you back to your childhood, Wyoming’s best ice cream parlors have what you’re looking for. Here are our favorites. Big Dipper’s website proudly states, “We take your ice cream cravings seriously.” And boy, does that ring true! Everything at Big Dipper is made in-house, which includes ice cream, gelato, and sorbetto. The ice cream flavor list will make your mouth water just reading it, featuring flavors like blueberry cobbler, chocolate macaroon, cookie dough, espresso chip, pistachio, red velvet cake and maple with toasted walnut! “An oasis for ice cream lovers,” Farson Mercantile is home of the “Big Cone.” Not only is Farson’s ice cream delicious, but they have great pizzas, subs and gourmet coffees. Ice cream flavors include butter pecan, cookies and cream, maple nut, and praline pecan. You can also choose from a variety of toppings such as hot fudge, peanuts, coconut, Oreos and the classic sprinkles. Many locals consider Moo’s to be the best ice cream in the state, and they’re certainly making a good case for themselves. Situated in downtown Jackson Hole, Moo’s serves up natural and organic ice cream and sorbet. The ice cream is made with entirely organic cream—which has helped to earn it a two Certificates of Excellence from TripAdvisor. The Food Network even called Moo’s Wild Huckleberry ice cream the best in Wyoming! Cole Stone is an American staple. This Cheyenne creamery features flavors from “Birthday Cake Remix,” to “Chocolate Devotion,” to “Peanut Butter Cup Perfection.” Is your mouth watering yet? Cold Stone Creamery has perfected the art of ice cream making, and if you find yourself in Cheyenne, you’ve got to stop in. It’s not just delicious espresso that Huckleberry’s is serving up. This cute Rawlins spot is loved among locals, featuring affordable ice cream with flavors like salted caramel, cookie dough, and more. The serving sizes are also very generous. This mom and pop shop is truly something special. Try one of their 16 hand-dipped flavors or three soft serve flavors. They even make their own waffle cones! The service is exceptionally friendly and the portions are huge. What more could you ask for? This ice cream stand is a must-experience. Not only are they serving up high-quality ice cream, but the atmosphere is perfect for hanging out with friends and family on a nice day. Flavors include “Huckleberry Heaven,” “Death by Chocolate” as well as cotton candy, black licorice and cookies and cream. Scream Shack is only open during the summer, so you better get over there while you can. This adorable little shack is a popular Lander ice cream spot, featuring flavors like lemon meringue pie, vanilla bean, and bear claw (dark chocolate ice cream with chocolate-covered cashews and topped off with a caramel swirl).